I wasn’t at the battle of Lewisham in August 1977. For some reason I was away from London and so missed the events that took place. One of the best account of them – and some great images – is in the issue of Camerawork about the event, and it’s worth getting hold of a copy if you can. You can also read a great deal of detail – along with pictures and video etc – on the Lewisham77 web site. Briefly, the fascist National Front tried to march from New Cross through the centre of Lewisham. Local people and socialists from all over London and further afield came to stop them – just as the East End had stopped Mosley in Cable Street in 1936. The NF were demoralized and defeated – and so were the police. After the NF had been sent packing, the police turned on the socialists with unprecedented brutality – particularly be the Special Patrol Group. But the demonstrators fought back and with the youth of Lewisham, largely black, defeated the police. There were many arrests, and it was the first time that British police used riot shields outside of Ireland. Lewisham Police station was partly trashed, and was later replaced by a new fortress, said to be the largest police station in Europe. 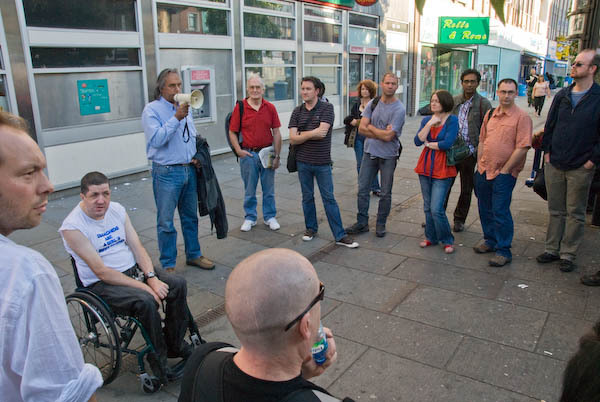 Batwinder Rana talks about the Battle of Lewisham in Lewisham High Street. Last Saturday, as a part of ‘Lewisham’77’, a series of events organised by local historians and activists supported by the Centre for Urban and Community Research at Goldsmiths University of London and other groups held a commemorative walk from Clifton Rise in New Cross to Lewisham High Street, with some of those who were present recounting their experiences at key sites along the route. If you were there, Lewisham77 would like to record your memories of the event for a DVD and publication. Since it is now over 30 years after the event, you apparently no longer have to be afraid about revealing any illegal actions! More pictures from the commemoration on My London Diary. This entry was posted on Thursday, September 20th, 2007 at 08:05 pm and is filed under My Own Work, Photo History, Political Issues. You can follow any responses to this entry through the RSS 2.0 feed. You can leave a response, or trackback from your own site.